The global population is projected to hit eight billion people within 20 years. With a growing population, dramatically more food, water and energy is needed. Yet even today, food and water supplies are becoming increasingly stressed in the face of climate change, development and unsustainable natural resources consumption. Recent drought-caused food price hikes have provided a glimpse into what the resource-constrained future would look like without significant action. 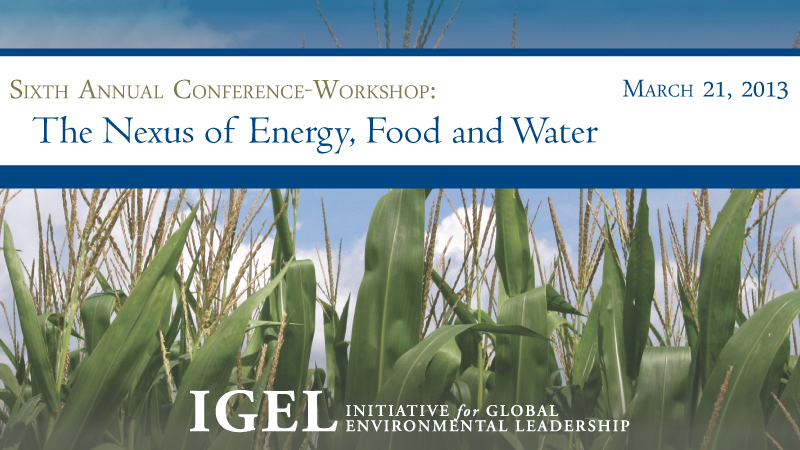 The concept of the food-water-energy nexus refers to how each one of those things affects the other. Water is the most important part of this nexus, because it cannot be created or substituted. Water also directly affects both of the other items. For example, most forms of energy production require substantial amounts of water for cooling and mining. Agriculture accounts for more than 70 percent of global water withdrawals. By comparison, around 16 percent of global water withdrawals are for the industrial sector. More than three billion people will be living in water-stressed areas by 2020. A major problem in addressing these issues is that both climate change and the food-water-energy nexus cross geopolitical boundaries, and require coordinated efforts from governments, businesses and NGOs. Between recent global and regional conflicts and the economic slowdown, however, political will and ability to address climate change in a systematic way is limited. Yet there is growing awareness about the interconnectedness of food, water and energy. The United Nations’ Millennium Development Goals (MDGs) were a first attempt to promote sustainable development. The second iteration of these goals, the Sustainable Development Goals, goes further to try to create a green growth economy. Businesses are also increasingly focusing on these issues. The World Economic Forum released an overview report in 2008 about the nexus, looking at it through the lens of the growing global water shortage. The Initiative for Global Environmental Leadership (IGEL) is hosting a conference on this nexus in March 2013, in response to feedback and with input from our corporate advisory board. The agenda is being finalized currently, but panelists will focus on innovations and business solutions. Solutions will have to be multi-faceted, and include business-led propositions, technological advances and capacity-building and better policy design. Some businesses have entered multi-stakeholder agreements, like the CEO Water Mandate and the UN Global Compact, as well as many others, to help coordinate efforts. Other institutes and think tanks have advocated integrated policy approaches, such as integrated water resources management. – Similarly, policy must encourage energy and water efficiency, in cars, buildings, and industries. Policy with negative effects, such as encouraging biofuels and natural gas production without consideration of water use, must be addressed. Similarly, policies must be smarter and tend towards integration of water, energy and food issues. Putting water, food and energy policies, if they exist, in separate silos, allows poor and inefficient planning decisions. – Another necessity is transferring technology to emerging markets, where most of the world’s population growth will occur, to help developing countries avoid unnecessary waste of resources. Helping these countries meet their growing demands sustainably will help the entire world address climate change and may potentially help avoid geopolitical conflict. Addressing climate change and properly managing food, water and energy supplies will require a level of coordination and cooperation never before seen. IGEL looks forward to working on more solutions in March at our conference. If you have other thoughts or links you would like to share, please leave a comment below. This entry was posted in Uncategorized and tagged conference, energy, food, population, sustainability, water. Bookmark the permalink.